Our Climate is Changing. It's Time to Talk About Geoengineering. Planet Earth is humankind’s biggest experiment. From the moment we figured out how to use fire and alter the land through farming, humanity turned the planet into an immense, long-term experiment of what happens when we tinker with the types and quantities of gases in the atmosphere. Recent advances in technology, along with the sheer number of humans alive today, sped up this experiment, and the initial results indicate that our impact may not be a positive one. Studies suggest it’s unlikely that humanity will be able to keep Earth’s average temperature from rising less than 2 degrees Celsius (3.6 degrees Fahrenheit) above pre-industrial temperatures, the oft-cited “tipping point” beyond which humanity cannot return. If that happens, the planet will be plagued by massive droughts, more frequent extreme weather, and catastrophic sea level rise; humans populations will likely suffer due to widespread disease and increased famine. To ameliorate the potential damage, some people suggest its time we start a new experiment on Earth, one we initiate on purpose to undo some of the damage wrought by climate change. That experimental solution is geoengineering, a process in which we alter the Earth’s climate to make our planet more livable for human beings. Experts have suggested a number of methods that we could use to actually go about this, though the technical challenges for implementing each would be immense. Accomplishing these proposals would also require a precise and sustained collaboration between nearly every nation on Earth, a feat that has never been accomplished. On top of that, scientists are still divided over the safety of geoengineering. That’s partially because, thanks to the number of variables that affect Earth’s climate system, any scheme could have side effects that no scientist could predict. But scientists also accuse one another of pushing faulty science in order to snag a profit, embittering both sides. Geoengineering has become a lightning rod of controversy, dividing researchers as much as climate change itself has in the political sphere. Yet new versions of these planet-altering proposals persist. Many scientists hold on to geoengineering strategies as last-ditch efforts to save our future from ourselves, should all else fail. Martin’s bold pronouncement kicked off a decade of research into one of the first geoengineering schemes that scientists considered potentially viable. Called iron fertilization, Martin’s idea is fairly simple in principle. All it requires is dumping a layer of iron, likely in the form of greenish crystals of iron sulfate, on a broad swath of the ocean surface. 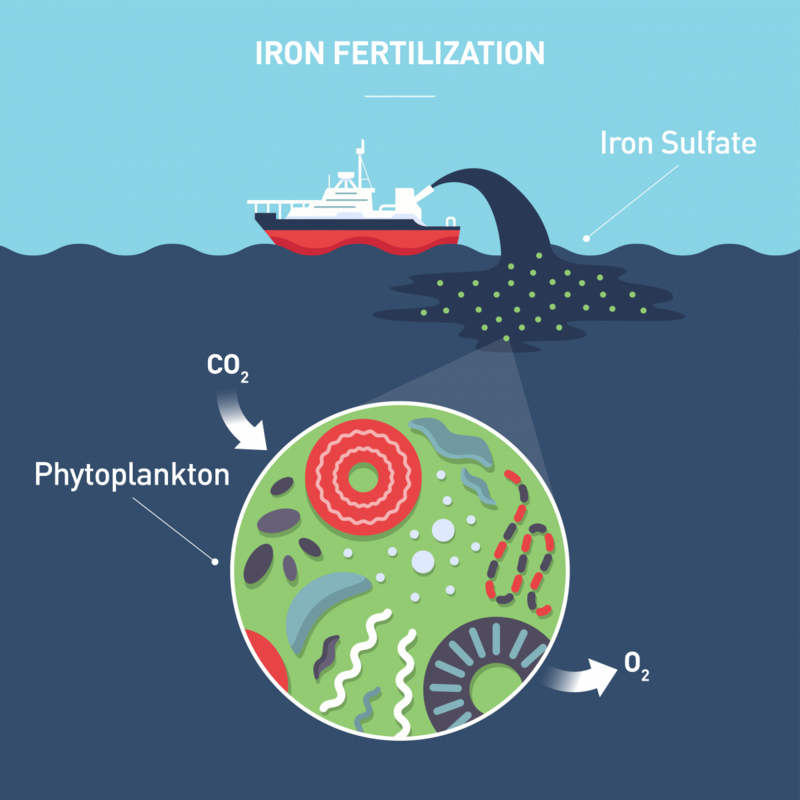 The iron stimulates the growth of phytoplankton, minuscule marine plants that absorb carbon dioxide and release oxygen. In theory, if done on a massive scale, iron fertilization would remove a large portion of anthropogenic carbon dioxide from the atmosphere, proponents say. The oceanic carbon cycle, in its natural form, already transfers around 10 gigatonnes of carbon from the atmosphere into the deep ocean per year, and it provides around half of our planet’s oxygen, according to NASA. So what could go wrong if humans amplified it on purpose? The answer is, in short, a lot. Marine scientists have emphasized that, while large phytoplankton blooms do take up carbon dioxide while they’re alive, when they die, their tiny decomposing bodies attract bacteria. Dying phytoplankton gathered en masse can cause the digesting bacteria to use up all of the oxygen in the surrounding waters, creating a “dead zone” that can kill or sicken anything that swims into it. 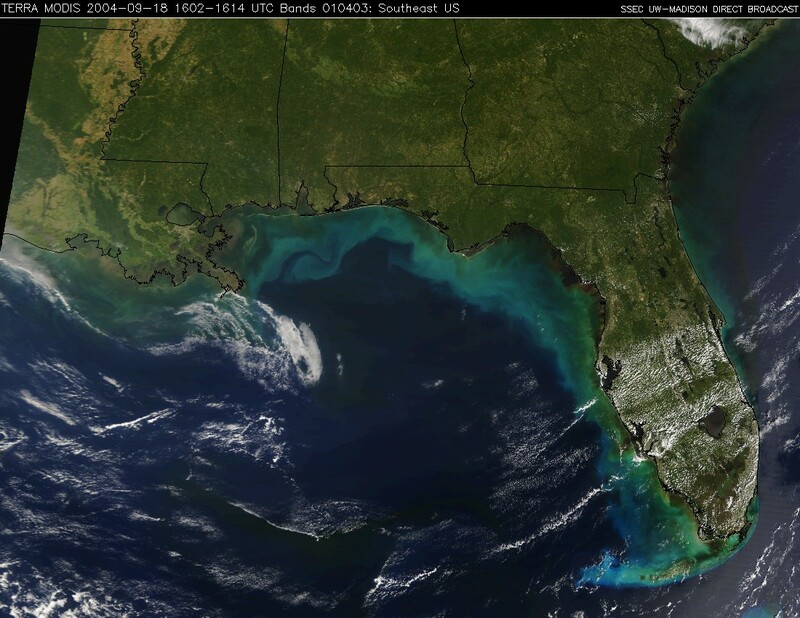 These enormous lifeless patches increasingly trouble the Gulf of Mexico, where nitrates from fertilizers running down the Mississippi River have induced blooms that cover as much as 8,700 square miles (over 22,500 square kilometers). These dead zones lead to large fish kills and worsened health for surviving animals; it can even trickle down and depress the catch of human fishermen. To top this all off, models of even the most “ideal” iron fertilization attempts show it would likely have little impact on global carbon dioxide levels. Like many geoengineering schemes, the allure of iron fertilization lies in its simplicity: it’s relatively cheap, relies on technology we already have (namely, fertilizer), and uses a process scientists already understand. Other proposed geoengineering strategies are not so obviously elegant. 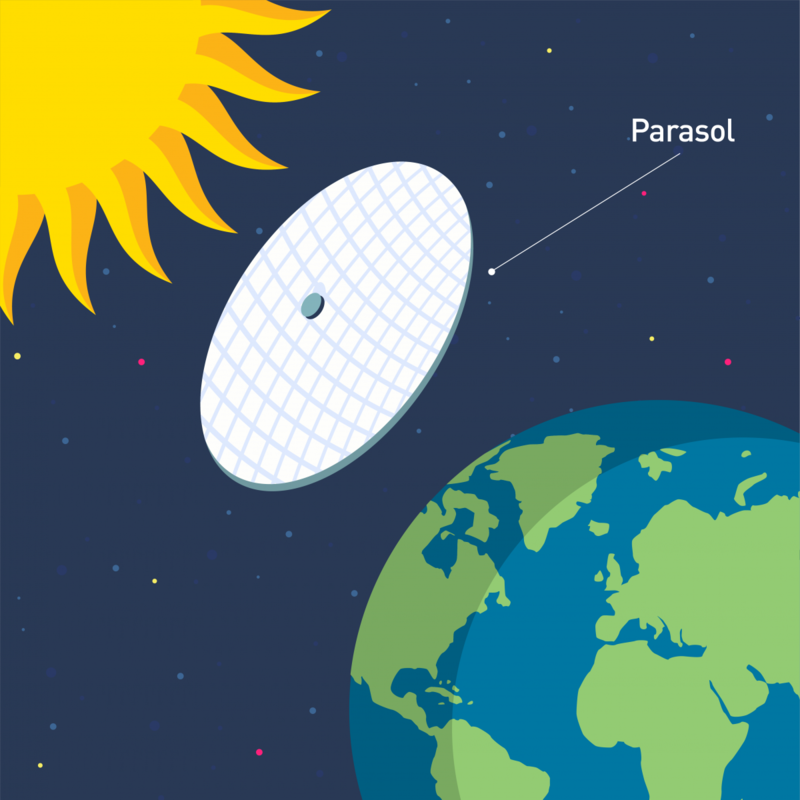 Take, for example, the idea of placing floating arrays of mirrors or massive “parasols” in space to reflect or block sunlight. After launching these massive objects into space or constructing them there — for example, on the moon — they would be positioned into the gravity-balanced point between Earth and the Sun, or in a ring around our planet. A 2006 NASA-funded research effort found that, by reducing global sunlight levels by just 2 percent, the Earth would cool enough to balance even a doubling of atmospheric carbon dioxide. At best, these proposals are logistically challenging. They would require billions of dollars to engineer the devices and get them into place. Plus, we still don’t know much about the potential side effects of directly cutting off sunlight, which some experts predict could reduce agricultural productivity, alter weather patterns, shift polar ice coverage, and change the patterns of ocean circulation. These days, researchers are leaning more towards geoengineering techniques that mimic Earth’s natural processes. The leading method among geoengineering proponents is stratospheric aerosol injection, a process in which reflective particles are released into the upper atmosphere. 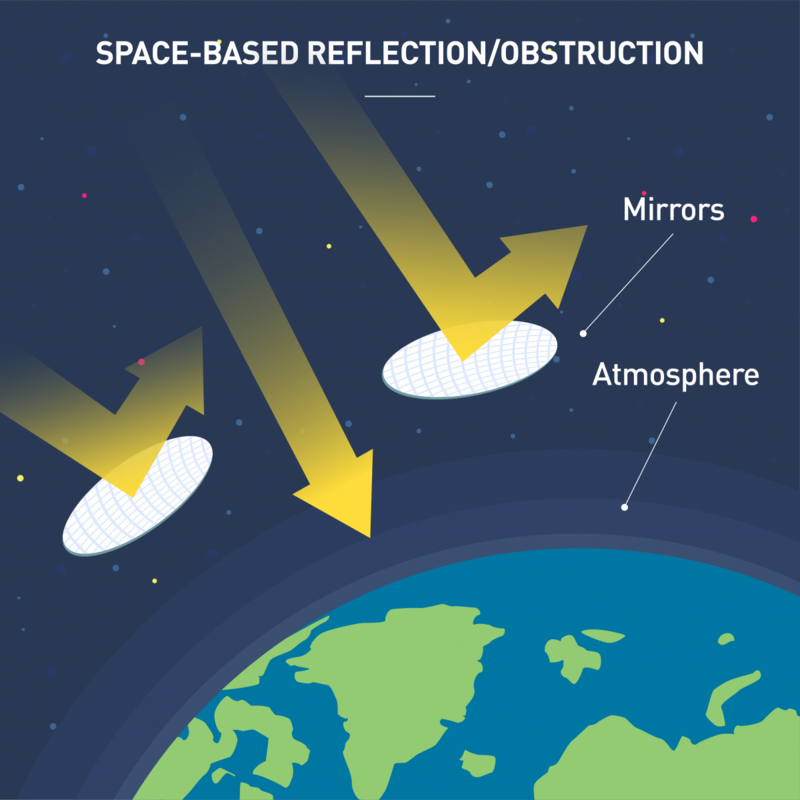 If this method were to work as intended, the particles would reflect incoming light, reducing the overall greenhouse effect of the atmosphere. This method essentially mimics the output of volcanic eruptions, which have demonstrated a cooling effect on the planet in the past. There are risks here, too, though. A recent modeling study in the journal Nature showed that stratospheric aerosol injections in the Northern hemisphere would slightly cool the region and could even decrease North Atlantic hurricanes. But it would also cause devastating droughts in sub-Saharan Africa. The opposite — releasing these particles in the atmosphere above the Southern hemisphere — would increase rainfall in sub-Saharan Africa but increase the number of tropical cyclones hitting the eastern United States. In both cases, this would occur because the regional jet stream would get stronger and shift towards its respective pole. The only way to avoid this would be constant or regular injections — at the least, every six months, Haywood estimates — at high altitudes around the equator in order to make sure the particles would distribute evenly. This would require a near-global agreement by world governments, a consensus of everyone on the planet to alter the place we’ve always lived. 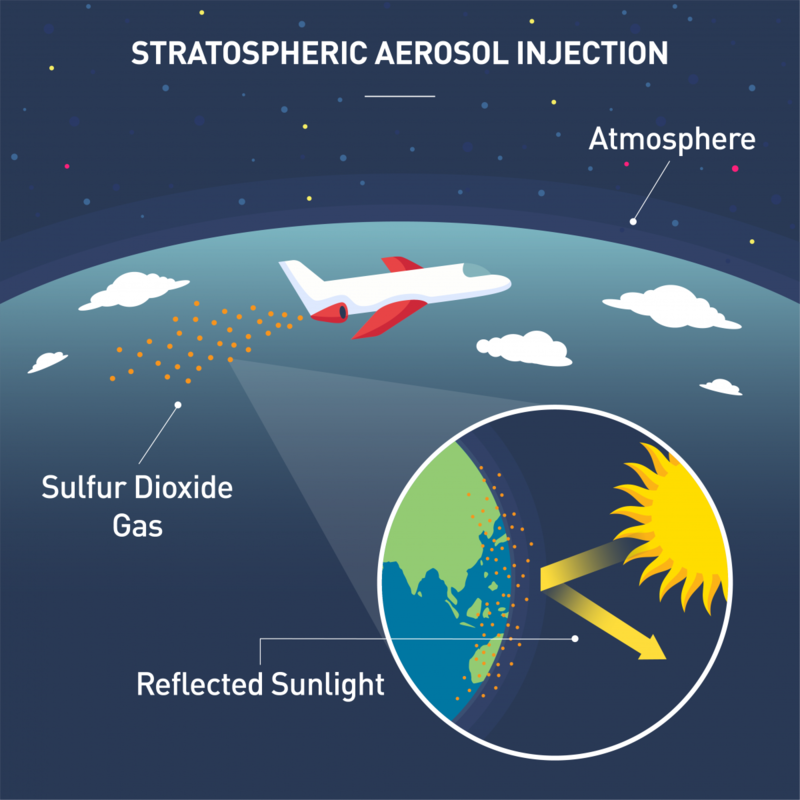 While reflective aerosols would lower the temperature of Earth, they wouldn’t do anything to reduce the amount of greenhouse gases still in the atmosphere. Therefore, this scheme would also require that we maintain this layer of reflective gas continuously, for decades, while also slashing our overall emissions. If we didn’t, the planet could actually end up worse off. For most geoengineering plans to truly mitigate the effects of climate change, a one-off investment wouldn’t cut it. They would require sustained investment over decades or even over centuries. “All the models suggest that if, say, you were geoengineering from now into 2100, and then suddenly stopped in 2100 … you would get all of the global warming accumulated in the business as usual model, in about five years,” Haywood says. This rebound, known as the “termination effect,” means that if humans want to use any geoengineering scheme based on reflection (those that use aerosols or reflective surfaces), we would also have to dramatically reduce the amount of greenhouse gases in the atmosphere, and the amount of emissions we produce. That would put us on a course to maintain geoengineering for a long time, through changes in political regimes, economic prosperity, and social priorities all the while. This is the real problem, according to those who oppose geoengineering: We would rather find a “quick fix” than do the hard work of cutting our dependence on fossil fuels. Yet those fixes don’t exactly work the way we think they do. We’re thinking about our planet the way some people think about losing weight; we would rather take diet pills and continue eating terribly, but in the end, we’ll end up working much harder than if we had just stuck with diet and exercise. “[Geoengineering plans] ignore the question as to why there’s not enough political will to have done more to tackle climate change until now, and they, in turn, serve to justify the inaction,” Silvia Ribeiro, the Latin America Director of the ETC Group, which monitors the ecological and socioeconomic impact of new technology on the poor, told The Guardian. We’re thinking about our planet the way some people think about losing weight; we would rather take diet pills… but in the end, we’ll end up working much harder than if we had just stuck with diet and exercise. Even proponents of geoengineering are worried these plans could encourage political entities not to actively reduce emissions — U.S. Secretary of State Rex Tillerson, for example, recently called climate change “just an engineering problem,” suggesting he’s unlikely to promote strategies for limiting climate change in the first place. Scientists themselves are tired of getting dragged into the debate. One NASA scientist opted not to be interviewed for this story, telling Futurism via email: “Geoengineering is a delicate subject and I’ve learned to be overly cautious, I’m afraid!” Another researcher in marine science asked to be interviewed anonymously, citing weariness of news articles that downplay the risks of geoengineering, as well as concerns that many proponents were motivated by profit from associated companies or patents rather than making a difference for the planet. Where does this leave us? To make a decision about anything related to climate change, no matter if it’s with geoengineering or reducing emissions, the process on the human side is fundamentally the same: We all need to sit at the table and agree to collaborate to make it work. Even if a miracle-pill geoengineering technique were to emerge tomorrow, one that would guarantee a return to pre-industrial climate without side effects, we would still all have to decide to test and implement it together. So the problem moving forward probably won’t be a lack of scientific wherewithal or political heft — it’s simply that we have trouble agreeing. That’s a problem harder than any scientific challenge, and one as old as our species. Yet, in order to avoid a worst-case scenario, it’s one we’ll have to overcome.